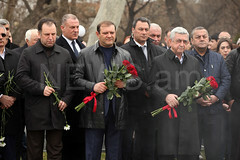 YEREVAN.- Acting PM’s wife Anna Hakobyan has visited the family of Karen Ghazaryan captured by Azerbaijan. 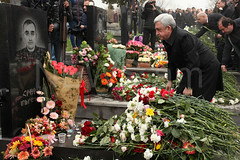 The family lives in Berdavan village of Tavush Province, Anna Hakobyan spokesperson noted. Anna Hakobyan informed that Human Rights Defender of Armenia Arman Tatoyan recently applied to The United Nations High Commissioner for Human Rights and the Council of Europe Commissioner for Human Rights over Karen Ghazaryan’s issue. Mrs. Hakobyan hoped that the international institutions, particularly ICRC will act promptly. “The lawyers told us that Karen Ghazaryan’s case at the ECHR is in a stage that the explanations of the Azerbaijani side are expected. The lawyers assure that our position is very firm, at least for the point that Karen Ghazaryan is neither diversionist nor a terrorist. Karen has serious health problems and the proofs of that are presented to the ECHR”, Anna Hakobyan said, emphasizing that in her opinion if all the bodies work well and do what they have to do, it’s impossible that this issue does not find a solution. Referring to the proposal of Azerbaijan to exchange prisoners, Anna Hakobyan said that it’s cynical proposal. “As far as I know there is no international practice of exchanging war criminals with civilians”. 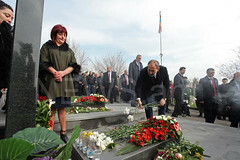 Hakobyan noted that the Azerbaijanis who are in Armenia have been imprisoned for killing a 16-year old child.